So, I’m currently cruising at 30,000 feel looking down on Mt. Shasta. Quite a sight, that lady. Are mountains men or women? Montana. Mont. Not sure. However, this mount seems like a lady to me. A few thoughts have flitted through my mind the last day or so. We flew to Portland for the holidays. This is my first Xmas with no one from mom’s side of the family. With all my relations having “moved on”, as it were, we decided to head north to spend the holiday with our son and cousin, Susie, and her family. Her international family. With in-laws from Istanbul and Barcelona, it is a wonderful change up for us. And the trip did not disappoint. As always, funny things happen when you are away from home. The funniest of the bunch was Rayman using his phone app to get us lost. Now, for regular readers, this is nothing new. We specialize in losing ourselves. However, this involved a new twist. We were walking. Hoofing it. In the cold gray air of downtown Portland. “Turn right”, he said and we dutifully obeyed. We being myself and Larry, my cousin’s husband. 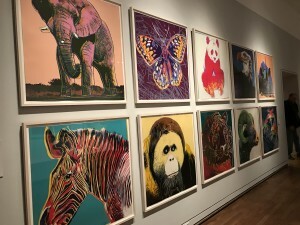 We were in search of the Portland Art Museum and we had parked our car at a shopping center and we bought tickets to ride the rail across the river and into downtown thereby avoiding high car park prices and the aggravation of finding a place to park the car in the city. We did that part without a problem because the train knew where it was going. And a man with more jewelry on his face, than I had on my entire body told us what station to disembark on (bad syntax, but I can only do so much). The jewel-faced man was actually quite nice which makes one wonder…why did he decorate himself so? Maybe he wanted to draw attention away from his very short legs? One can only speculate. After we turned right, we were walking up a hill and all I could see was freeway signs. I inquired, “Are you sure we were suppose to turn right?”, knowing that Rayman is dyslexic and prone to error in certain areas of life. When we were in the financial services industry, Rayman would often times elicit great gasps from our clients when he would misspeak. An example. He would be advising someone with an account balance of, say, $560,000 and he would spurt out, “Well, you have a balance of $560.” Some would be polite and pretend they did not notice. Others, choked. Still others cried out, “$560?” Oops. Anyway, we stopped mid-block to check the app on his phone and he said, he was sure we were headed in the right direction. So we soldiered on. But I could not see a Museum. Only signs announcing streets to the motorists below (the road crossed over the freeway). By this time, even the Rayman was wondering if he was right. So, another stop in the sidewalk. As you may have guessed by now, we should have turned left. So, we turned around and headed back to where we started. The walk was invigorating especially as I ribbed him (he would describe it as harrassment) as we galloped down the hill. We were to meet up with the kids and now we were late. I had to hand it to him. He has expanded his abilities to get lost. Or perhaps I just forget that we have been lost on foot before. In fact, I’m sure we have been lost on foot before but as I age, I have more to forget. 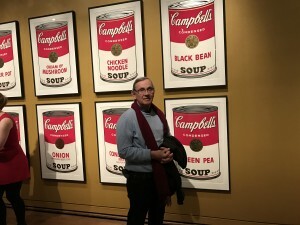 The reason we were looking for the Museum is that an Andy Warhol exhibit was featured and Ali and Bernat (eldest daughter of Susie and Larry and her husband from Barcelona) had invited us to join them to view it. And then Ryan (number one son) and his girlfriend, Tamara, joined in the fun too. And we were all meeting there. What a show. Here’s some pictures. Endangered species. Totally awesome and horribly sad at the same time. 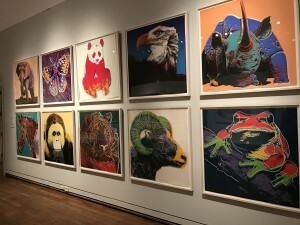 And when discussing the exhibit afterwards we discovered we all had our favorite works and they were as divergent as we all were. Totally fun. 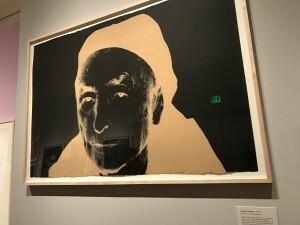 Georgia O’Keefe by Andy Warhol. We grabbed a bite at the Elephant cafe and then went to see La La Land at the movie house just a short block away. A very pretty movie with an O’Henry ending, in a way. Rayman and I could not remember the last time we saw a musical. But it was fun trying. Grease? West Side Story (just kidding). But we could not remember. Emerging from the theatre, it was raining and oh, so cold. We walked briskly to Ryan’s car. He gave us a lift to our car. And from there we all congregated at a pizza joint that Susie found in a magazine. It was raining and cold but warm and inviting in the Firehouse Pizza restaurant. After a wonderful time with everyone but Kristen and Cenk (Kristen was home with the kids and Cenk was working at Costco). We missed them sorely. A good time was had by all in attendance. And to go back to the beginning, we made it home with a stop off at the Lund’s in San Jose to pick up our car (we Ubered to the airport and back) where we had lunch and were back at the house at dusk. Our dinner the first night back. 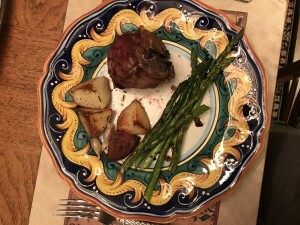 Barbecued lamb chops, roasted potatoes and asparagus.